Baile mór i ndeisceart Thiobraid Árann is ea an Chathair (Cahir as Béarla), áit a dtugtaí ’’Cathair Dhún Iascaigh’’ uirthi tráth. Tagann an logainm ón daingean cloiche a tógadh fadó ar oileán in abhainn na Siúire, abhainn a bhfuil an Chathair suite ar a bruach. Tá breis is 2,500 duine ina gcónaí ann agus a lion ag méadú, agus tá breis is 5,000 duine sa cheantar máguaird. Is féidir Cluain Meala, Caiseal agus Tiobraid Árann a bhaint amach faoi cheann tríocha nóiméad de thiomáint, agus shroichfeá Corcaigh, Luimneach agus Port Láirge faoi cheann uair an chloig. Tá caisleán suntasach sa Chathair ar leis na Buitléaraigh é tráth agus a mheallann a lán cuairteoirí anois. Rinneadh deisiú éigin air idir na blianta 1840 agus 1846, agus an eagraíocht Dúchas atá ina fheighil anois. Léiríonn sé a thábhachtaí a bhí an Chathair anuas go dtí an 16ú haois mar ionad ceannais agus cosanta i ndeisceart Chúige Mumhan. Tháinig Cromail chun na Cathrach sa bhliain 1650 agus lig don gharastún géilleadh agus imeacht. Anuas go dtí an 17ú haois ní raibh sa Chathair ach sráidbhaile, agus ba é an margadh an príomhghnó a bhí ann riamh. Sa 19ú haois bhí beairic mhór ann agus reisimintí marcra ar lonnú ann. Bhí na sléibhte faoi choillte móra anuas go dtí an 17ú haois, agus tá a n-iarsmaí fós ann, cé go bhfuil neart crann neamhdhúchasach measctha tríothu. Tá a lán siúlóidí oidhreachta ann, agus tá éileamh ar shiúlóid Choill Ghleann Garaidh, coill mheasctha sna Gaibhlte. Tá Cnoc Mhaoldonn ar an taobh theas den bhaile mór agus Uaimh Bhaile Mhistéalaí siar ó dheas uaidh. Bhí tóir ar bhradáin riamh san áit, mar is léir ón seanlogainm Cathair Dhún Iascaigh, agus is breá le lucht iascaireachta an chora éisc atá os comhair an chaisleáin amach ar an taobh eile den droichead. Théadh cóistí Charles Bianconi idir Cluain Meala, an Chathair agus Caiseal, agus sheasaidís ag teach sa Chearnóg mar a bhfuil The Galtee Inn anois. An t-ailtire nótálta John Nash a dhear teampall breá paróiste de chuid Eaglais na hÉireann sa Chathair, teampall atá ar cheann de thrí fhoirgneamh eaglasta dá chuid in Éirinn. Baineann an Chathair le barúntacht Uíbh Eoghain agus Uíbh Fhathaidh Thiar (Uí Fathadh agus Uí Fothadh Thiar), ceantar a raibh Gaeilge na nDéise an-láidir anuas go dtí na 1830í. Is dócha go raibh an teanga ag 99% den phobal chomh déanach leis an mbliain 1800. Bhí 60% á labhairt fiú sna 1860í, agus chomh déanach le tríochaidí an 20ú haois bhíodh sí le cloisteáil sa Chathair lá margaidh. Canúint de Ghaolainn na nDéise atá i gceist, agus a comharthaí sóirt féin aici. Rinneadh árthú d’athrú, ceárthú de cheathrú, agus áirthí d’aithrí. Bhíodh meititéis ann: bradán > burdán, brollach > burlach, praiseach > puirseach. Ba mhinic foirm an tabharthaigh uathu le haithint ar an ainmneach uathu: bróig, cois, cluais, láimh agus eile. 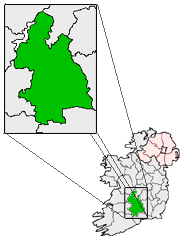 Agus bhí foclóir ar leith ann: binín (bean bheag), coifín (cónra), ruaim feirge (racht feirge), scrobanta (críon, caite), taobh ismuigh (taobh amuigh), agus mar sin de. Maidir leis an briathra, feicimid athruithe mar a leanas: teagmhaím > tangaím, tiomáin > tumáin. Shéimhítí an saorbhriathar san aimsir chaite: bhuaileadh é seachas buaileadh é. Ba mhinic de á úsáid in ionad an ghinidigh rannaigh: mórán de dhua, an iomarca de shrian, leath an oiread de chúram. Is minic a d'úsáidtí foirm neamhspleách an bhriathair nuair a bheadh coibhneas neamhdhíreach ann: an tslí a bhíodh [a mbíodh] a chosa fillte isteach faoi aige; pé áit a bhíodh [a mbíodh] sé ag obair. Tá seanchanúint an cheantair marbh anois, cé go bhfuil a rian le haithint ar Bhéarla na háite. Bhí roinnt cainteoirí dúchais beo fós i lár an 20ú haois. Tá mótarbhealach (an M8) laistiar de Chathair agus is féidir teacht air ón mbaile mór ag Gabhail 10 agus 11. Téann Bus Éireann tríd an mbaile mór go dtí Baile Átha Cliath, Corcaigh, Luimneach agus Port Láirge, agus tá an stad i lár an bhaile mhóir i Sráid an Chaisleáin. Is fada an Chathair suite ar an iarnród réigiúnach idir Luimneach agus Port Láirge; d’oscail an stáisiún ar 1 Bealtaine 1852. Is annamh traenacha ag seasamh anois ann. Teampall paróisteach de chuid John Nash. Grianghrafanna a thugann léargas ar stair an bhaile mhóir. Tugadh an leathanach seo cothrom le dáta an 28 Iúil 2017 ag 15:02.